CDU staff member, Suzi Lyon will show her photographic work in Projection from side of wall from 10 May to 26 May at The Gallery, Casuarina Campus. 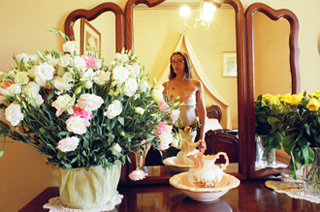 The exhibition is a photographic essay of the artist watching herself in a mirror while undergoing treatment for breast cancer. Her body changes, she watches and records. The watcher has become the watched. This exhibition consists of digitally generated colour prints, sourced from 35mm negative film, measuring 61mm x 44mm. This work has been a tool for the artist with which to approach this disease, but is also a message of encouragement to women, and men, about breast cancer awareness. The exhibition opens on Thursday 10 May at 6pm and runs until 26 May in The Gallery, building 12, Casuarina campus, Charles Darwin University. Suzi is co-ordinator creative arts and lecturer printmaking/ceramics at CDU.